ALL AROUND DESIGN – Great for flatwater, river runs and small waves. Can support beginner riders up to 240 Pounds. Deck Mounted Bungee System for Carrying Extra Gear & Nose Mounted Handlece! HIGH DURABILITY – No need to worry about dings or damage. Run it over with your vehicle, throw it off the roof or ram it into rocks or a pier; its military grade material is nearly impossible to damage. Born and Bred on the water in San Diego California Since 2004. Our team is committed to bringing you the best quality paddle boards designed and tested by people who surf and paddle every day. Our 30 Day Ride it and Love it Guarantee! Ride it and Love it or Return it! If you don’t love your board we will take it back! We stand behind every product we make 100%! The perfect iSUP board to fit all skill levels! Our ISLE 10′ All Around Airtech® Fusion-Lite Inflatable Paddle Board model is our bestselling SUP model – and for good reason. The trim, stylish design fits riders of all sizes looking for a versatile board shape for both flat water, small surf performance and everything in between. Includes 3 Piece Aluminum Adjustable Travel Paddle, Carry Bag, High Pressure Pump & Gauge (Inflates to 15 PSI), and Removable Travel Fin. 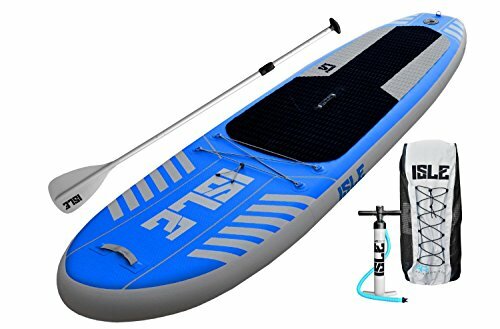 Our ISLE 10′ All Around Airtech® Fusion-Lite Inflatable Paddle Board is now 30% lighter than comparable inflatable paddle boards without compromising quality. To obtain this we utilize a unique high end manufacturing process and machine coat the drop stitch with a special seal and bonding layer, and then add another machine-laminated, higher-density PVC layer. This effect is to remove any human factor or error in the bonding process. This creates a consistent, unique bond by a highly controlled machine process that’s just not achievable via the previous hand-gluing methods of our competitors. The end result is a lighter, stiffer, more durable iSUP board without any of the extra weight. TRAVEL PADDLE, CARRY BACK PACK, PUMP, FINS & REPAIR KIT INCLUDED – Includes 3 Piece Aluminum Adjustable Travel Paddle, High Pressure Pump & Gauge (Inflates to 15 PSI), Removable Travel Fin and Repair Kit.